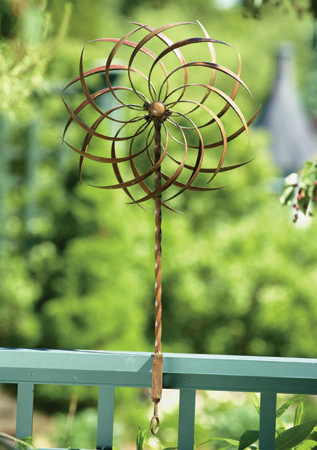 Add elegance to your garden with our new top-selling Pinwheel Deck Spinner. This Kinetic Wind Art Garden Spinner mounts easily to your deck railings, embraces the wind and gracefully spins in multiple directions. If you are looking for unique garden wind art with a high-end, you will love this metal wind sculpture - truly beautiful in your yard whether it is in motion or not. The Pinwheel Deck Spinner by Ancient Graffiti comes in an antique copper verdigris finish, and mounts with a simple and secure screw clamp. This item is not intended to be a fast powered turbine where the beauty in design is completely lost. It is also not a flimsy cheap plastic twirler that spins for a day and falls apart. This artfully crafted metal spinner has been designed with elegance and durability in mind, so that it truly showcases as garden art when still, and provides a visually stimulating effect when spinning in the breeze or high winds. The entire spinner and twisted stake are finished thoroughly to withstand the elements, but will also age beautifully over time. To prevent weathering, additional poly coats can be applied as desired. Ancient Graffiti is known primarily for their collection of nature-inspired gifts for the home and garden that are "handsome, built to last, and of good value." We at GardenFun take special appreciation in their concern for "green" manufacturing. Ancient Graffiti has been known to take pride in their great efforts to partner with artisans that use and promote sustainable, organic, natural and biodegradable resources. Mount Opening: Up to 2.25", Weight: 4.65 lbs. High-quality Metal Spinner with Twisted Stake. Bold and Beautiful Deck Mounted Wind Art. Elegant Design when still or spinning in wind. Weather resistant antique patina finish. Provides endless motion and fun!